Under their project titled âIncreased Production of Roots and Tuber Crops in the Caribbean through the Introduction of Improved Production and Marketing Techniquesâ, they have undertaken several developmental endeavours in St. Vincent. The fruits of their labour were proudly displayed on a tour jointly organized with the Ministry of Agriculture, Rural Transformation, Forestry and Fisheries. This tour, carried out last Tuesday, August 9, 2011, featured a contingent which included Montgomery Daniel, Minister of Agriculture, Arlington Chesney, the Executive director of CARDI, its country representative Gregory Robin, other stakeholders in the agriculture industry and the media. 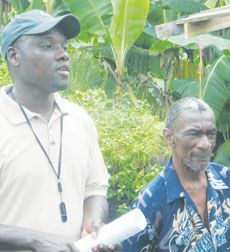 Starting at the Ministryâs offices in Kingstown, the group made the journey to Akers, where the first project, a Sweet Potato Demonstration Plot, was displayed. This plot, which features 9 different varieties of sweet potato, is geared toward improving the standard of product grown in St. Vincent. Gregory Robin outlined that different growing techniques and technologies were used and the most viable and productive will be passed on to farmers. He noted that they plan to produce a user- friendly manual to assist farmers with their work in this field. From Akers, the group travelled to Calder to view one of several farine processing plants, which were upgraded from their prior deplorable conditions through the Common Fund for Commodities (CFC) a group executed by CARDI. The plant, though still under construction, is manned by a visibly delighted Percy Dean, a farine processor for many years. He highlighted the fact that since benefitting from the CFC, he has already been able to up production considerably and reduce physical energy output. National Coordinator of the fund Rohan McDonald, speaking to SEARCHLIGHT, said that the initial project was to contribute equipment (which was done), but they also saw that it was prudent to refurbish the infrastructure of the plant. The final display of work in progress was done at Rabacca, where a cassava demonstration plot was exhibited. Touted by Robin as being arguably one of the largest collections in the region, in terms of variety, the Rabbaca cassava plot, like the sweet potato plot in Akers, experiments with different planting techniques, varieties and technologies, passing on the information to farmers. Additionally, there exists a steady supply of planting material grown at the plot which would allow farmers to plant more frequently, and not just after they harvest, as was the case previously.